The beauty of water is reflected in the clear serenity of a garden pond. 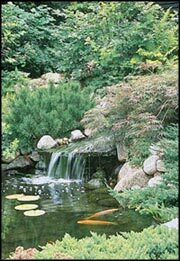 To create a unique and beautiful focal point in your garden, add a garden pond. There are many styles to choose from. Some are preformed and can be installed easily or you could build it as a “do it yourself” project. No matter which you choose, your garden pond will give you, your family and guests many pleasant moments. Before you begin thee are a few important points to consider. The space you have available for the garden pond. What will the theme of your garden be? Is your garden classic, formal or informal? How are you going to landscape the area surrounding the pond and garden? There are also additional items you may want to consider. A beautiful Garden Patio umbrella is the perfect accent for your home. It is helpful to have a general plan, with sketches, to get an idea of space and placement. Keeping all of this in mind have fun and you will enjoy your garden pond for many years to come.